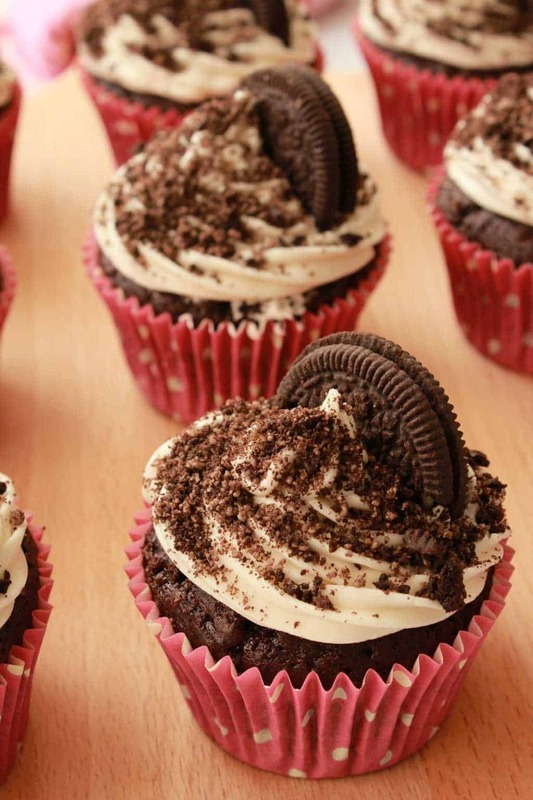 When I first started thinking about making some oreo cupcakes, I wasn’t sure how exactly one would do this. Would you put oreo pieces into your cake batter? 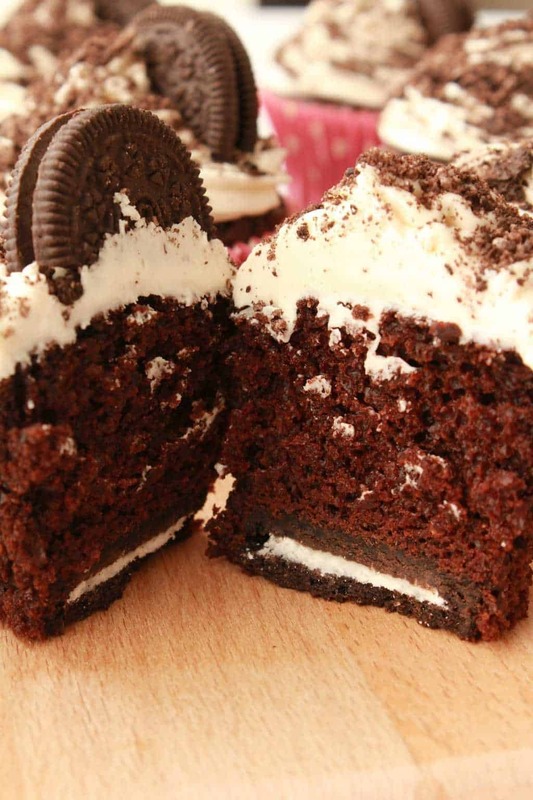 Would it just be a case of propping an oreo on top of a cupcake that would mean you could call it an oreo cupcake? Or mixing oreo crumbs into the frosting? 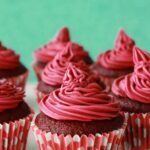 And so I went browsing recipes and pictures of oreo cupcakes and saw that yes, all of these, or one of these or some of these. I didn’t want to put oreo pieces into the actual cake batter because I thought that might be a bit wasted, OR, worse, it might affect the texture of the cupcake itself, which you just don’t want. 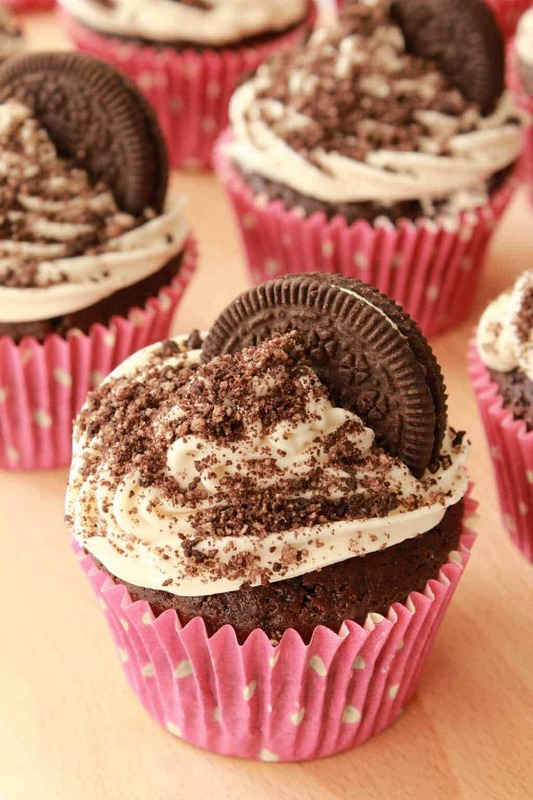 So I decided to bake the entire oreo cookie into the base of the cupcake, frost them with a simple vanilla frosting and top them with oreo crumbles and prop an oreo cookie half on top! I did try mixing oreo crumbles into the frosting directly, but I didn’t like how it came out. It turned the frosting a weird sort of gray color. It tasted good but the look was bad. Whereas oreo crumbles sprinkled on top of a vanilla frosting was super pretty. 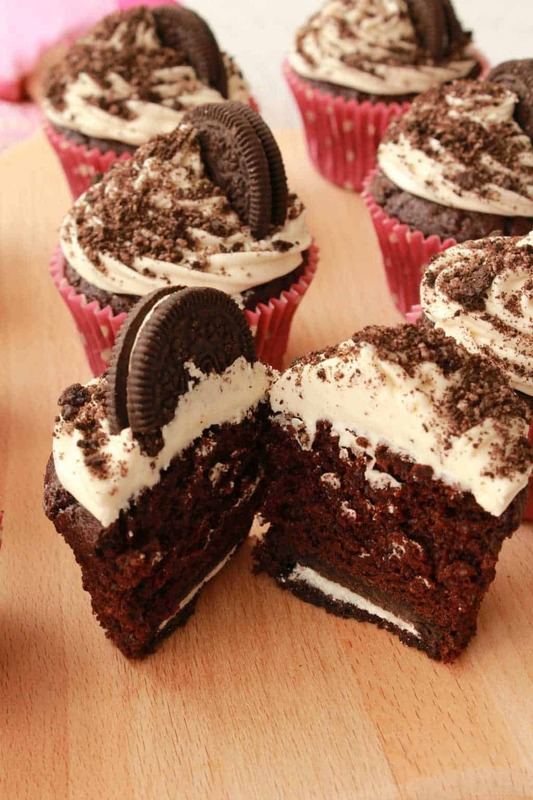 The oreo cookie at the base of the cupcake bakes perfectly into the cupcake, so you have a deliciously crunchy cookie base, with moist and spongey cake in the middle and smooth, velvety frosting on top. 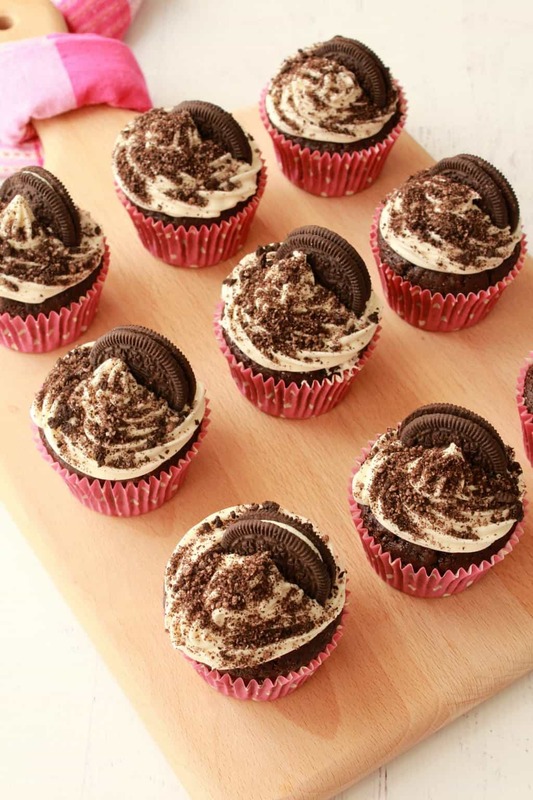 An extra half oreo cookie propped on top at a jaunty angle (or just straight up) gives these gorgeous cupcakes some flair! They’re pretty, they’re tasty, they’re super chocolatey, they’re for oreo lovers everywhere! 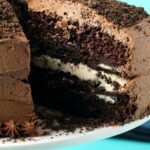 I am indeed an oreo lover, which is why I’ve already made a chocolate peanut butter oreo pie, a chocolate ganache pecan pie (on an oreo base) and chocolate oreo cheesecakes! 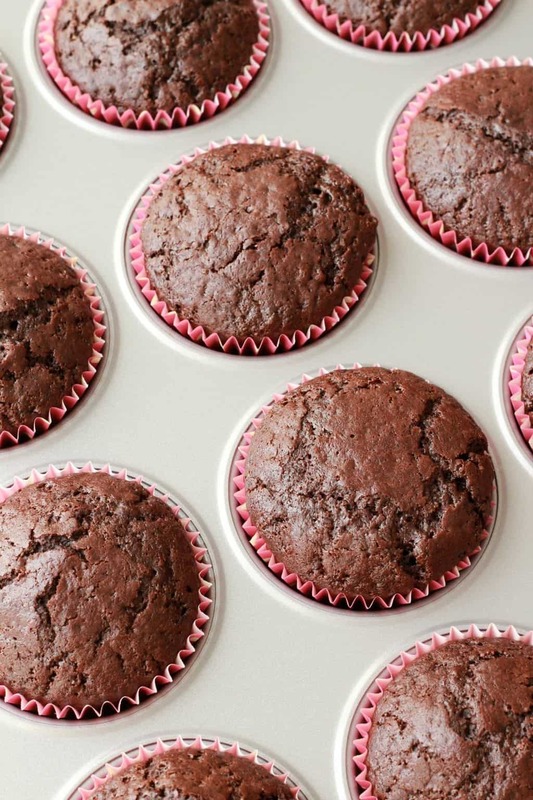 And if you worried that baking a whole cookie into the base of the cupcake might make the cookie seem a little overbaked (after all – it’s already cooked when it goes in), then never fear! The oreo cookie withstands the extra baking wonderfully, and comes out pretty much the same way as it goes in, except for the fact that it is now part and parcel of the cupcake! Topped with a velvety vanilla frosting and oreo sprinkles! 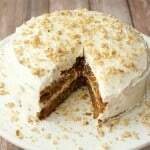 You will love the contrasts of texture between the crunchy cookie base, the moist and spongey cake and the velvety smooth frosting topped with cookie crumbles! 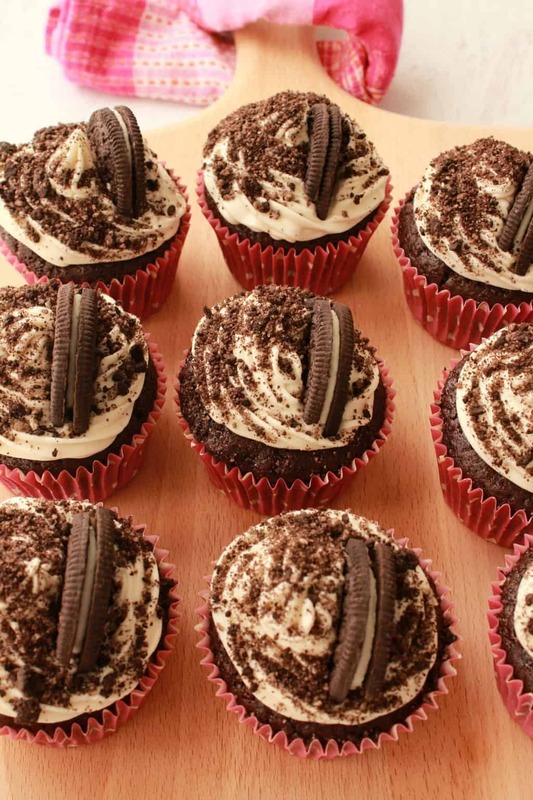 So whaddaya think of these oreo cupcakes then? Let me know in the comments! And if you make them, pop back and rate the recipe and let me know how they turned out. If you take any pics, tag us #lovingitvegan on instagram! I’d love to see what you’re baking! And if you haven’t already – sign up to our mailing list for an awesome free ebook (with 10 gorgeous recipes) and that way you’ll stay updated with all our latest recipes posted to the blog. Yippee! 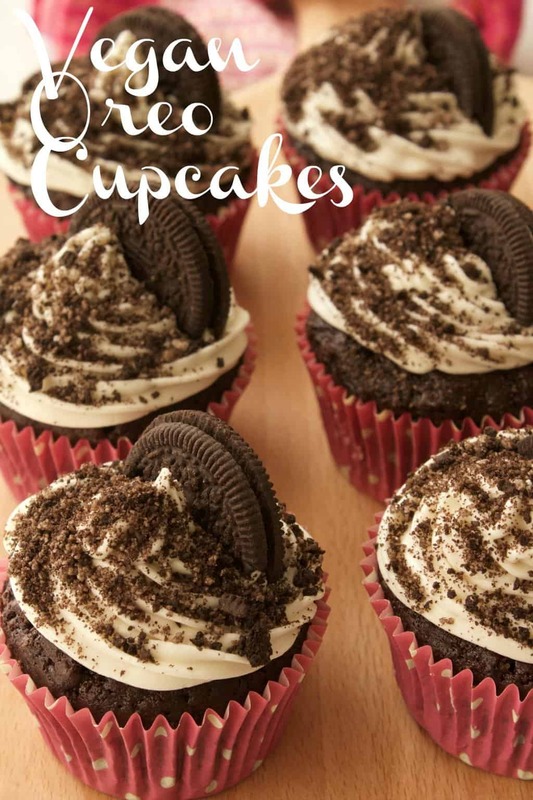 Moist vegan oreo cupcakes with delicious contrasts of texture between the crunchy oreo cookie base, rich spongey chocolate cake and velvety smooth frosting! Sift the flour and cocoa powder into a mixing bowl and then add the sugar, baking soda and salt. Add the soy milk, vanilla extract, oil, and vinegar to the mixing bowl and mix in. 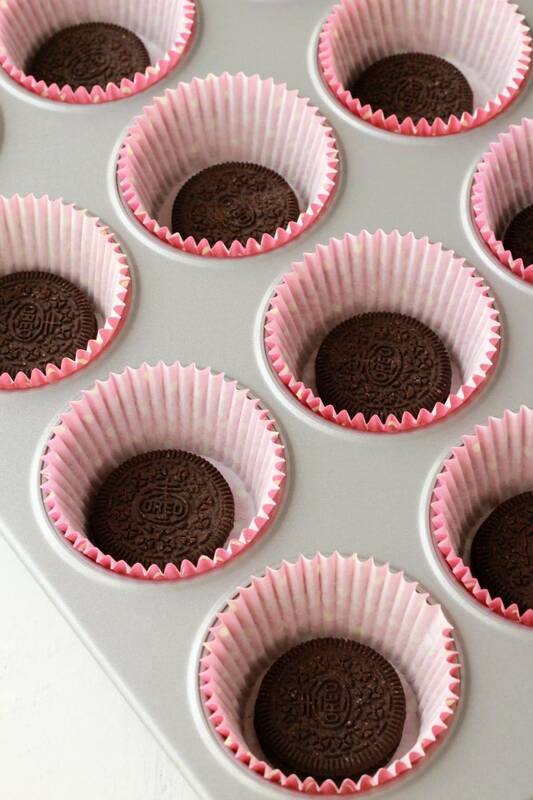 Line a cupcake tray with cupcake liners and place a whole oreo cookie into each liner. 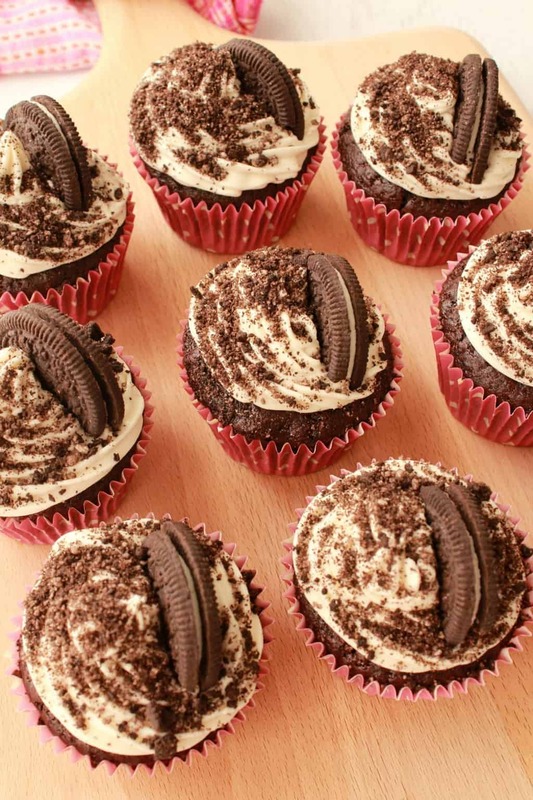 Then divide the batter evenly between the cupcake liners, pouring the batter directly on top of the oreo cookie. 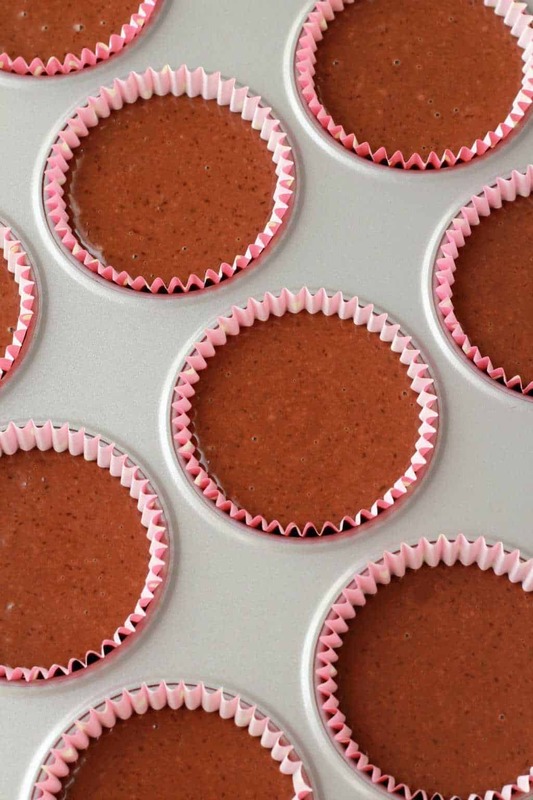 When the cupcakes are baked, transfer them to a wire cooling rack and allow to cool completely before frosting. 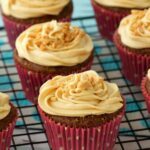 Prepare your frosting by adding the powdered sugar, vegan butter, soy milk and vanilla extract to an electric mixing bowl and starting at slow speed gradually increase the speed until the frosting is thick and smooth. If your frosting is too thick, add a tiny bit more soy milk. If it’s too thin, add some more powdered sugar. When the cupcakes are cool, pipe the frosting onto the cupcakes. Crush 4 oreos and spoon the crumbs over the top of the frosting. 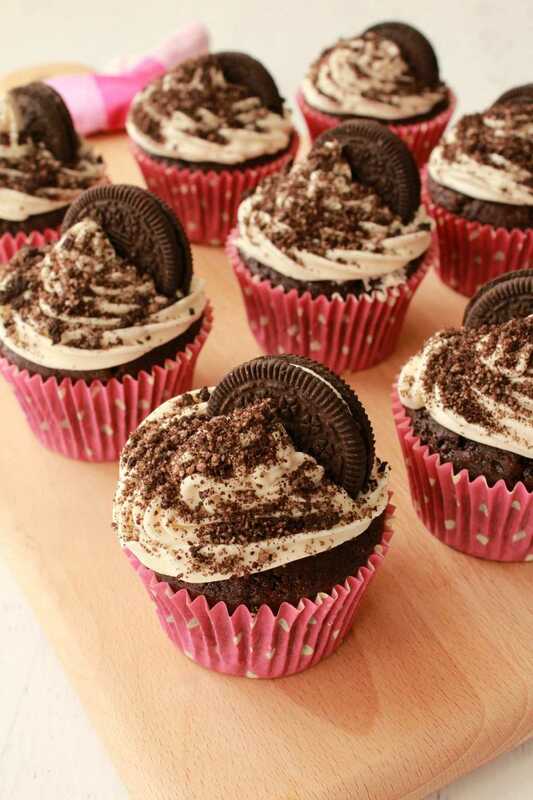 Then break another 6 oreos into halves and prop them on top of your cupcakes to serve. 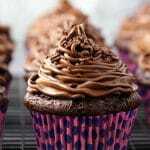 *Adapted from my Chocolate Cupcakes. *Nutritional information is based on 1 cupcake of 12 including frosting, sprinkles and oreo cookie topping. If they’re covered, then yes sure. They are good covered at room temperature for a few days. These are amazing!! I didn’t change a thing. I need to remember for next time to not put oreo on top until just before serving. I decorated the night before and the oreos went soggy. But still yummy. 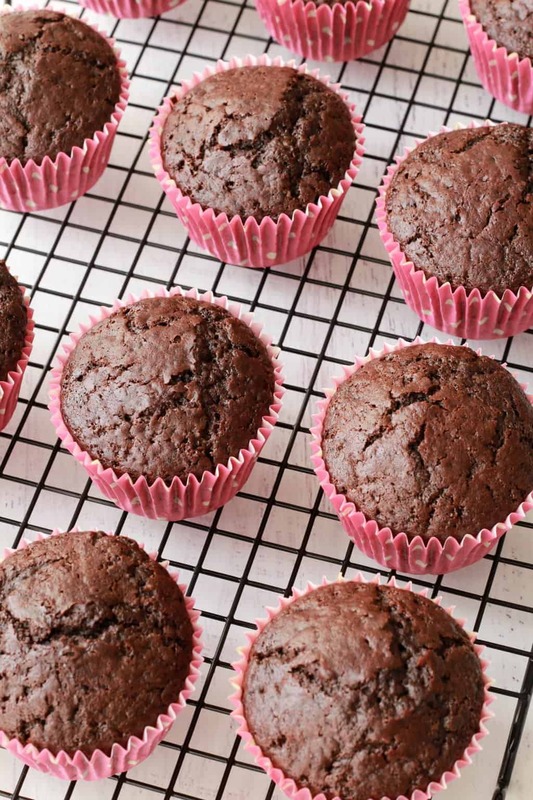 Tried this out yesterday and the cupcakes turned out incredibly well 🙂 i don’t usually find much luck whenever trying new recipes, but i think this might be the most perfect batch of cupcakes i’ve ever made – vegan or not! 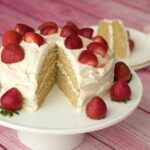 the tops were soft even as the cake was fully baked through, and the sweetness of the cake is just right for it to be eaten on its own. the buttercream would’ve been too sweet, so i used a 1:1 ratio of vegan butter and powered sugar instead (about 1 cup each). 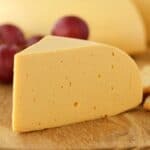 Hi there, I am looking for a dairy free but not necessarily vegan recipe for my son’s birthday party this weekend. 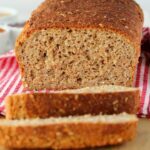 Can I use an actual egg rather than a flax egg? Thanks and can’t wait to try these he loves Oreos!!! 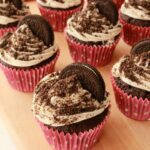 I made the oreo cupcakes using your recipe and they turned out just wonderful! Since the first time I made them, which was a week back, I have made three batches already! 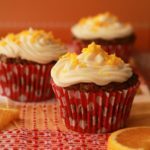 This has to be the best eggless muffin recipe I have come across till date. I call it eggless çause I used regular milk instead of soymilk. Thank you. I replaced the flax egg with half a banana (mashed) and it worked out really well. 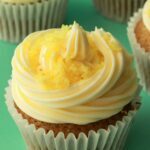 I didn’t have any icing/frosting piping bags, so I spread the frosting on with a teaspoon instead – not as fancy, but it tasted good anyways! I halved all the ingredients for the frosting except for the soy milk, since I use less frosting than you tend to do in your recipes. I also ran out of oreos so I improvised and replaced the oreo sprinkles with a small bit of cocoa powder sprinkled over the frosting.